Even though I didn’t attend GenCon this year, I followed eagerly the twitter chatter to see what was going on and what interesting games were coming our way. Such following of interesting new games is inevitably followed by purchases of said interesting games, thus this weeks new arrivals. The latest acquisitions: 4 purchases and a KS reward. Boxes are getting bigger and bigger. So, I ordered four new games (Trains, Warmachine: High Command, Railways Express and Mascarade) and received as a Kickstarter reward Storm The Castle!, which I wasn’t expecting yet. 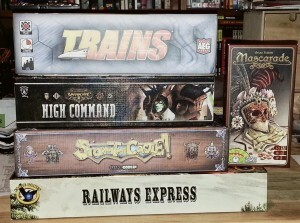 This entry was posted in new to me and tagged Mascarade, Railways Express, Storm the Castle!, Trains, Warmachine: High Command on August 30, 2013 by TopDog.